Why is gold valuable? For thousands of years, gold has functioned as a store of wealth that sees its value climb in times of economic or societal unrest. Gold jewelry has been a sought-after luxury good since before the dawn of the first civilizations. Gold has seen its value increase as time goes on. Gold’s non-correlation to stocks and many other assets make it a financial safe haven during market downturns or "black swan" market shocks. 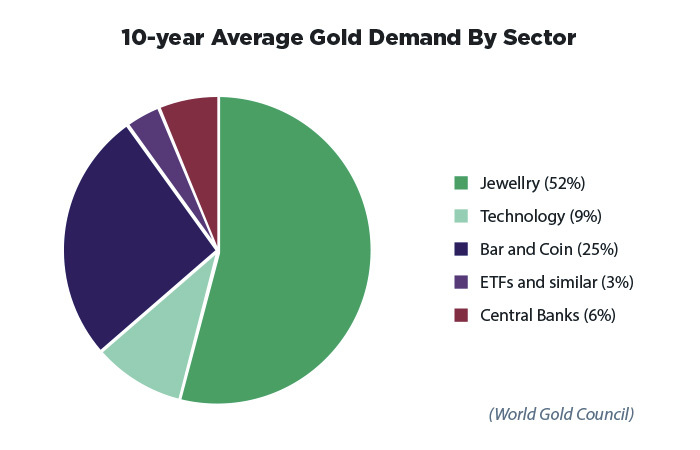 Gold's modern value is augmented by growing industrial and medical demand. Its physical properties make the “yellow metal” an indispensable element in everything from space probes and electronics to medical implants and cancer treatments. Gold has been prized for its beauty and rarity since prehistory. There is evidence to believe that gold, not copper, was the first metal our ancestors fashioned into items. Found in a nearly pure form in nature, this bright, easily worked metal quickly became treasured for its beauty. With the development of large, centralized societies, gold took on a financial aspect as well as an ornamental one. As a result, gold became one of mankind's first non-perishable assets and long-term stores of wealth. The earliest known examples of gold jewelry were wrought from native gold 6,500 years ago, in the prehistoric Varna civilization along the Black Sea. The vast number of gold ornaments found in the graves at the large necropolis at Varna predate the first Sumerian and Egyptian gold jewelry by more than 1,500 years. These findings show that gold was already a symbol of power and wealth in the Neolithic period. Jewelry's importance as a status symbol in the ancient world reached its zenith in the extravagances of the Egyptian pharaohs. Today, jewelry is still the largest single use for mined gold (~49% in 2018, according to the World Gold Council). 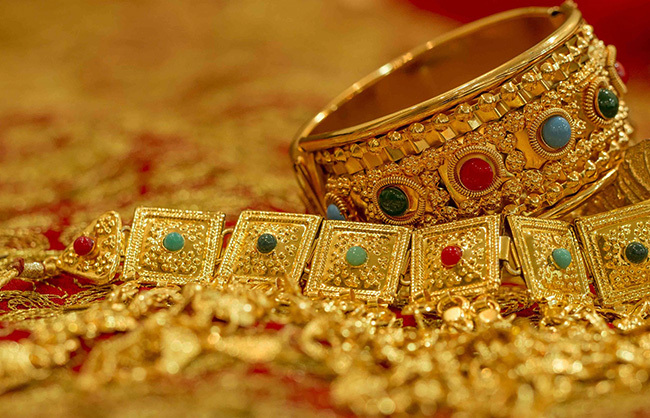 In emerging markets, where billions of people live with no access to a bank, purchasing gold jewelry is still the predominant method of storing individual wealth. It is no coincidence that China and India, with the world's two largest rural populations, account for more than half of global jewelry demand. One of the drawbacks of using fashion jewelry as a store of value is that tastes change. This is a minor concern in rural areas of developing nations, where traditionally chunky jewelry is favored more as a store of wealth than as a fashion statement. The design of gold jewelry takes on a greater significance in urban settings. When jewelry tastes change, the extra money paid above its weight and purity for a piece's artistic style are largely lost. The first major improvement over gold jewelry to safeguard wealth occured in western Turkey in the fifth millennium BC. The next step in gold's evolution as store of wealth (and in the advancement of civilization as a whole) was the invention of the gold coin. Gold's combination of high value and small size made it an excellent choice as a means of exchange in early history, especially in long-distance trade. Despite that, gold was treated as any other barter item. Each bar or nugget had its own weight and purity, which had to be determined each time it was traded. Gold jewelry had similar problems. The famous King Croesus of Lydia minted the world's first pure gold coins in approximately 550 BC. For the first time, the world had pieces of gold of a uniform weight and purity, made by a trusted authority. This idea quickly spread, expanding trade between cities and kingdoms, and making Lydia the first mercantile empire. For seven and a half millennia afterwards, monetary gold fueled unprecedented levels of commerce and international trade. At the same time, gold and gold-backed currencies enforced fiscal discipline on governments. As recently as the turn of the 20th century, people were suspicious of any government-issued paper money that could not be redeemed for gold or silver. It wasn't until the 1930s that gold ceased to circulate as money. As the global Great Depression hit, people of all nations flocked to the banks to exchange their paper notes for legal tender gold coins. The hoarding of these gold coins pulled tens of millions of dollars out of circulation, shrinking the money supply and causing deflation. This made the Great Depression worse, because governments couldn't just print more paper money to replace the millions of missing gold coins. Nations around the world were forced to take the remaining gold coins out of circulation, to prevent them from disappearing into people's safes and cellars. The governments then melted them down and added them to their national reserves. This forced the public to use paper money, because there were no gold coins they could exchange their notes for. Freed from the need to redeem their paper currencies with gold, governments could now print (and spend) as much money as they desired. The resulting deficit spending devalued each nation's currency. This situation increased gold's value (in countries where it could still be owned), demonstrating its ability to hedge against the effects of government overspending. In 1933, the United States government not only removed US gold coins from circulation, it confiscated privately-owned gold. Since then, the US dollar has depreciated approximately 95%. This means that $100 in 1933 is equal to five dollars today. Before the government confiscation of gold, you could have traded $100 in paper money for five $20 "double eagle" legal tender coins, each containing 0.9675 troy ounces of gold. That 4.8375 ounces of gold which was worth $100 in 1933 is now worth $6,385.50 -- a good example of how gold preserves your wealth against inflation! One significant endorsement of gold's value is the fact that the world's central banks continue to buy and hold gold as part of their official reserves. This has accelerated as more central banks prepare for another economic crisis. Central bank gold purchases hit a 50-year high in 2018. Gold is a highly liquid asset. Between $85 billion and $130 billion of gold trades every single day (spot market, options, and futures). This makes gold easy to buy and easy to sell whenever needed or desired. Gold is a safe haven. Physical gold is the only asset that does not suffer from default (counterparty) risk. Gold protects wealth against inflation, government fiscal and monetary policy, and sudden geopolitical and economic shocks (such as war or stock market collapses). Physical gold is preferable in some ways for these purposes, as a severe enough shock could prevent holders of gold futures, options or ETF shares from selling them for much-needed money as stock exchanges close during the crisis. In contrast, physical gold would be in great demand, and easy to sell at a profit. Gold is financial insurance. Gold plays a traditional role as a diversifier in investor portfolios, mitigating losses in times of financial stress. Note that like any other insurance policy, buying gold can only protect your wealth if you purchase it before you need it. 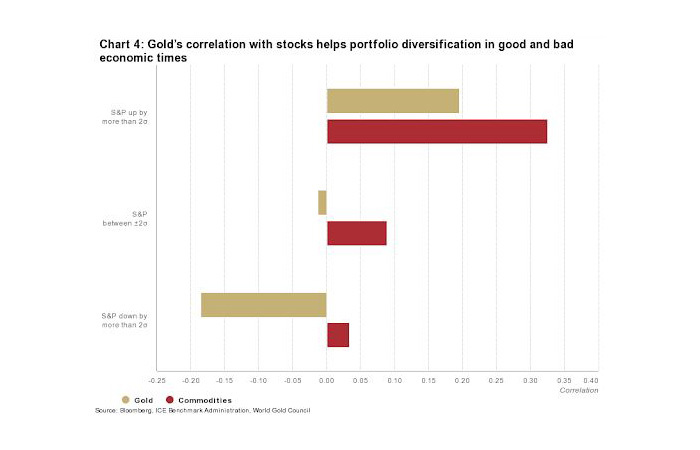 Gold is an efficient portfolio hedge, thanks to its negative correlation to most assets. For example, in good times, stock prices and the value of the dollar rises. Gold prices also rise in good times, just not as much as stocks. This increased gold demand during economic expansion is fueled by increased demand for jewelry and electronics. But in bad times, as stocks, currencies, (and sometimes even bonds) all fall, the price of gold rises even faster, erasing some of those equity and fixed income losses, and providing better overall portfolio returns. Another investment use for gold is as a currency hedge, especially between the dollar and emerging market currencies. The extra volatility of emerging market currencies and the expense of carrying traditional currency hedges can be a serious drag on returns. Gold works as a currency hedge simultaneously for multiple currencies, reducing the need to run a hedge for each currency pair. Non-investment uses for gold were discovered early in history. 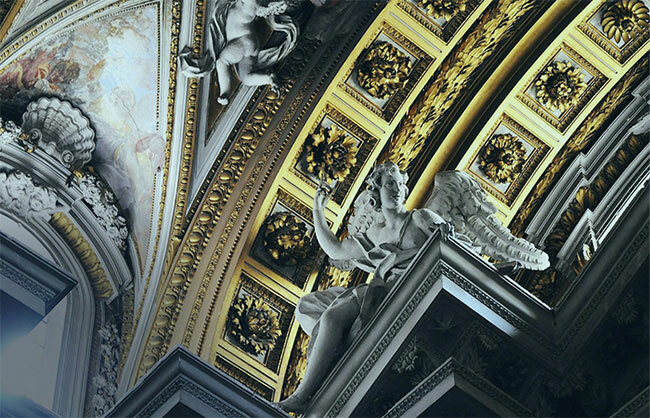 Gilt domes on buildings in the ancient world protected the underlying roof from the elements, while ceilings adorned in gold leaf were protected from the soot of fireplaces. Gold also has a long partnership with glass. In Roman times, gold salts were used to produce a distinctive red shade of glass known as ruby glass. Incredibly thin layers of gold less than a micron thick are used in modern windows to block heat from the sun. In energy production, gold nanoparticles have greatly increased the efficiency of photovoltaic cells used in solar panels, as well as improved the efficiency of hydrogen fuel cells. This has enormous potential for supplying clean energy that is not dependent on sun or wind, as well as improving power generation for manned spaceflight. Gold has also found a place in heavy machinery. 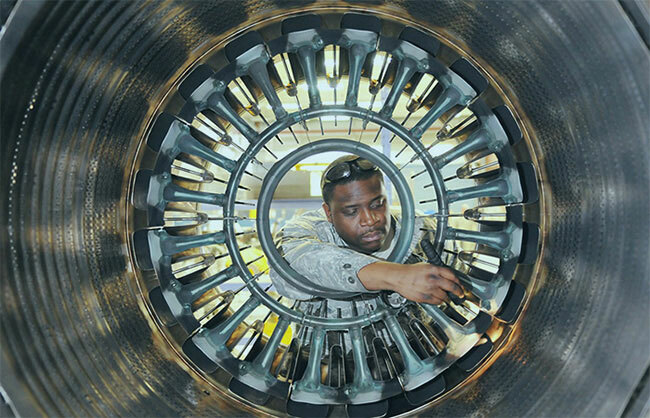 Gold plating of moving parts in corrosive environments such as inside jet engines allows them to last longer and perform better. In all of the above examples, gold either enhances an industrial process or protects the important components needed. Gold has grown exponentially in importance in technology, ever since the birth of the integrated circuit and the Information Age. While copper and silver are both more efficient electrical conductors than gold, that efficiency degrades as the connections tarnish and corrode. Gold connectors, however, do not tarnish or corrode. This makes gold the preferred choice for plating electrical connectors and in integrated circuits. Gold's properties as a tarnish-proof metal in electronics is especially valuable in situations where the circuitry will be inaccessible. This is most prevalent in the aerospace sector. Gold has played a major part in aeronautics since the dawn of the Space Race. Gold-covered protective surfaces reflect heat and radiation, protecting spacecraft and satellites from solar damage. These precautions are necessary, because there is no atmosphere in space to carry heat away from surfaces. Gold foil protects materials in space from getting hot in the first place.. The vision of astronauts is an even more important "sensor" that needs protection. 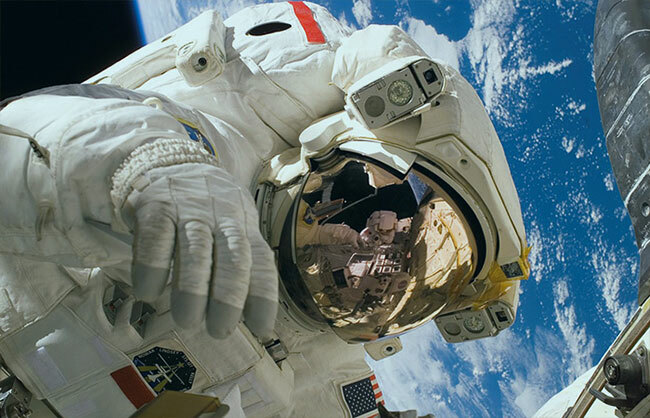 The gold coating on the visor of a space suit helmet reflects harmful infrared radiation, while still allowing the astronaut to see. The reflective gold coating on the visor also prevents the inside of the suit from overheating. Engineers designing the first satellites and space vehicles needed a lubricant for moving parts that could survive the harsh cold, heat, and radiation of space. Traditional lubricants and greases break down nearly immediately in this environment. Gold's low shear strength and resistance to "cold welding" made it an obvious choice for coating moving parts where they touch. Gold's use in medicine has expanded greatly from the days where it was only used for tooth fillings and wiring dentures. Gold's ability to treat arthritis was first discovered in 1929. Gold's anti-microbial properties make it the choice for coating implants, especially in infection-prone areas such as the inner ear. 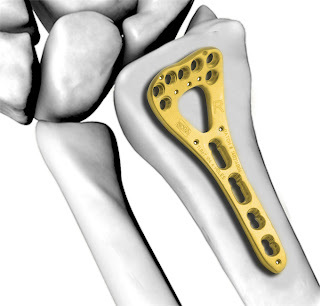 Gold is alloyed with titanium used in prosthetics, to reduce the chance the body will reject them. A new gold-titanium alloy (β-Ti3Au) produced at high temperature is four times harder than titanium alone, while retaining the reduced friction and increased biocompatibility of gold. A more drastic use of these antimicrobial properties is using gold compounds as a base for experimental medicines to combat antibiotic-resistant "superbug" infections. Gold nanoparticles are another promising player in medicine. They are used in a new "rapid diagnostic" malaria testing kit that is cheaper than previous tests, while also detecting malaria earlier. The World Health Organization reported that more than 300 million of these kits were sent to impoverished areas in Asia and Africa in 2016 to help combat the deadly disease. A rapidly expanding medical field is the use of gold nanoparticles to fight cancer. Gold nanoparticles are used to deliver "genetic payloads" to suppress tumor growth. Other specially-constructed gold nanoparticles can slip out of the bloodstream into tumors, but not healthy cells. In an innovative technique called "photothermal therapy," these nanoparticles are then hit with lasers to heat them up and destroy the tumor from the inside without the use of radiation. In a more mundane area, gold is also used to make pregnancy tests! Jewelry was not the only use ancient peoples had for gold. The shining magical metal that never tarnishes was a natural medium to depict the gods and the afterlife in art. For thousands of years, much of the artistic use of gold was for religious purposes. Pharaoh's masks, golden Buddha statues, chalices and crosses are notable examples of how gold elevated religious art. Gold leaf, which is gold hammered to a thickness of mere microns, was used to accent and beautify icons, frescoes, and illuminated manuscripts in many religions. It continues to have a place in art, gilding statuettes or frames for paintings, as well as accenting paintings themselves in a modern twist to medieval iconography. Another quirky "artistic" use for gold leaf is its inclusion in food -- most often as a coating for desserts. There are many vehicles available to the gold investor today: bullion, jewelry, self-directed IRAs, gold ETFs, and gold futures are the most prevalent. The "original" way to invest in gold is by buying physical gold. In developed nations, people looking to purchase gold as an investment vehicle will opt for gold bullion bars and/or coins. This sidesteps the premium on gold jewelry, and avoids the financial loss jewelry incurs when fashion tastes change. 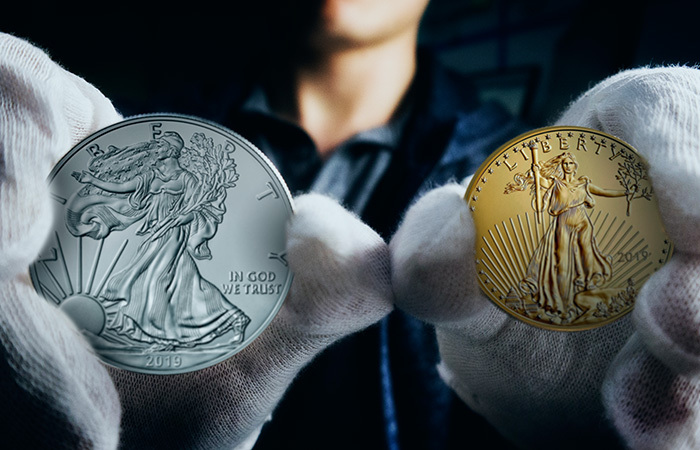 Two of the favorite gold bullion coin series are the American Gold Eagle and the Canadian Gold Maple Leaf. 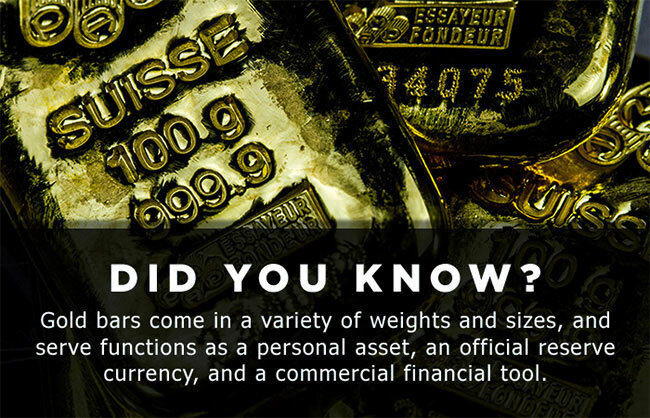 Among gold bars weighing from 1 kilogram to 1 gram, PAMP Suisse is one of the most popular names. In contrast, people in developing nations have traditionally purchased heavy, chunky jewelry as a store of wealth, especially in rural communities. Gold in these societies is often saved to serve as dowries when a family's daughter is married. A variation on holding physical gold is purchasing it through self-directed gold IRAs. This gives long-term investors the same tax advantages of a normal IRA but allows them to hold physical gold for their retirement. Despite the claims of some dubious companies, investors cannot hold their IRA gold at home. The gold in a gold IRA must be held by a custodian.This storage can be in insured vaults the custodian leases directly, or vaults at the bullion distributors where the IRA account is set up. Gold-backed ETFs (exchange-traded funds) have become a popular way for investors looking for a short-term exposure to gold's price movements and hedging properties. The popularity of gold ETFs among "weak hands" in gold investing can be seen by watching the inflows and outflows as short-term risk sentiment ebbs and flows. It is important to note that shares in gold ETFs are not a claim to gold, and cannot be redeemed for gold. The ETF serves only to provide investors with exposure to the gold price. Watch the video below to learn more about how gold ETFs work. Gold futures were originally intended to allow gold producers to sell future output, and allow gold consuming companies to lock in prices for the gold they would need later in the year. It has since become the playground for speculators and hedge funds to gamble on the price of gold. These market participants have no intention of actually accepting delivery of the gold contracts, just as they don't intend to take delivery of shipments of soybeans or live cattle. While these speculators don't actually want the gold, their actions drive the price of gold in the world market. Integrated circuits, medical implants, and the coating on an astronaut's helmet. These are a few of the uses for gold that were unimagined 50 years ago. What new problems will gold solve 50 years from now? Here's what remains the same: As it has since that first prehistoric man discovered pretty rocks in a streambed, demand for gold, and its value, will continue to grow. A published writer, Steven's coverage of precious metals goes beyond the daily news to explain how ancillary factors affect the market. Steven specializes in market analysis with an emphasis on stocks, corporate bonds, and government debt.